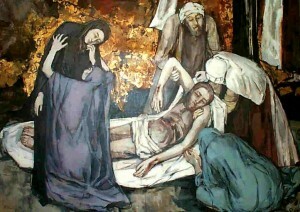 On Good Friday, the impossible happened. God Himself was executed by His creatures. On Easter Sunday, this same God, our Lord Jesus Christ, rose from the dead, victorious over the power of the grave. In so doing, he defeated death for the same creatures who had put Him to death. Christians marvel at and meditate upon these events, and indeed draw our very life from their historic and transcendent reality. It is common, and entirely appropriate, for us to see our own spiritual defeats and victories as little Good Fridays and Easter Sundays. Though we face suffering and tragedy, we believe that God will bring great good out of evil. We know that the Resurrection brings meaning and hope to every difficult situation. As every kid growing up in evangelical circles during the 80’s and 90’s knew, Sunday’s on the Way. The truth of the matter, however, is that we spend much of our lives living little Holy Saturdays. It is tempting to think the first disciples were dunderheads because they spent so much time “questioning what rising from the dead meant.” (Mark 9:10) When Jesus was laid in the tomb, they certainly had hope of some kind, but it seems that it never occurred to them that the Lord meant he would literally rise from the dead on the third day. Uncertainty reigned. Likewise, how often do we allow past disappointments, not to mention genuine tragedies, to cast a shadow over our daily lives? We profess faith in Jesus Christ and in His promises, but it is so difficult to truly take them at face value, believing He will bring us to a much better place. All things considered, I have been very fortunate. There have been very few, if any, genuine tragedies in my life. But, we all have our share of spiritual deserts, months or even years on end where failures or mistakes of the past weigh heavily on our hearts. We know, like the first disciples, that somehow God is going to bring us victory, healing, and yes, Resurrection, but Holy Saturday is long and dark and our memories of past deliverances fade as new difficulties mount. St. Ignatius identified two major recurring phases of the Christian life: consolation and desolation. In periods of consolation, we experience the full light of the Resurrection. Our faith is like a fire. We feel God’s presence in our lives, prayer comes easily, serious sin is more easily avoided, and the joy of life in Christ is tangible. These are the times, Ignatius says, when we should make major decisions, especially those that involve serious spiritual discernment. There is another thing we must do with times of consolation: remember them! They are inevitably followed by periods of spiritual desolation, where prayer is difficult and seemingly goes unanswered. Temptation becomes a greater struggle, particularly the temptation to make rash decisions. What we must do when faced with desolation is draw strength from those great periods of consolation we have experienced. To survive Holy Saturday, the disciples certainly thought back to the Transfiguration, the feeding of the five thousand, the many healings, and especially the raising of Lazarus. Could someone Who could do all those things, simply with a word, ultimately come to nothing? It wasn’t clear exactly how things would turn out well, but they simply had to. Likewise, we have all been blessed beyond measure countless times during our lives. When faced with darkness, keep your eyes on that light. When you are seemingly stuck in a never-ending Holy Saturday, remember that it is the necessary step between Good Friday and Easter.